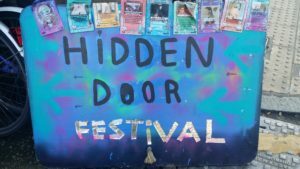 It was such a pleasure to be back at the Hidden Door Festival for their 2016 renewal, both on Saturday and Sunday just past. 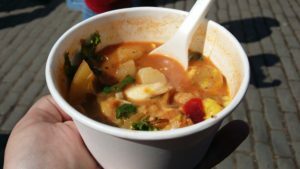 We’d been thinking a lot just recently about the 2014 festival, held in the East Market Street Arches, with the arrival of Baba Budan, Gannet & Guga, et al in those spaces. And we’d visited the King’s Stables Road site a number of times last year, and published a couple of pieces covering the food and drink. This year the programme packs in even more fantastic work and the courtyard was abuzz both days I visited. There’s some festival beer from Tempest plus continued support from Barney’s making the beer selection impressively good. On the food front, Fresh Revolution were knocking it out of the park this weekend, but finish up today, Monday. They’ll be replaced by a combo of Rost and Wild Rover for the rest of the run. Harajuku’s excellent gyoza and noodles and great burgers from the Edin-burgers round things out. 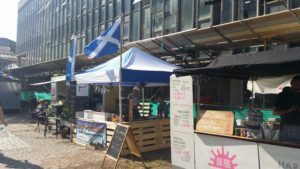 The festival runs until 4 June and is an absolute must visit, whether just to hang out and soak things in or to get more engaged and participative. So overall, make sure to visit the Hidden Door over the coming days. The full programme is available on the website. Access to the various exhibitions is free until 6pm, then ticketed after that. The food and drink is an excellent complement to the fabulous and carefully curated programme. More power to the elbows that continue to make this one of the city’s most dynamic and inspirational events.